LSQ: This is such a timely story, what with the whisper network of women actively rejecting their patriarchy. Did this idea come to you recently, or is it something that’s been brewing for a long time? To me, the Bog Witch is about ideology more than anything else. Ideology is like the eucalyptus tree; it grows stronger by poisoning the ground around it so nothing else can grow. It has previously been acknowledged (most often condescendingly) by powerful men that while they allegedly decide where society is headed, it is often women who get us there. That is to say, while men and their institutions make the rules, so to speak, women are given the choice of whether or not to pass them on to the next generation. So, we get the future, while they get Now. It’s been Now for a really long time. In fact, it kind of seems like it’s always Now. By promising us an inevitable transformation option we are lulled into a complacency that successfully obscures our possibilities right here, in this neverending present. What Taterra, my bog witch, succeeds in doing is changing the present, as well as the future of her little mudball moon by using the same subversive tactic naively offered to her by the patriarchy — imagination. Taterra doesn’t just imagine a future, she helps other women imagine that their present is different. That their present is changeable. That Now is what you make of it. 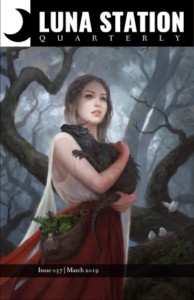 LSQ: What inspired you to have an older protagonist, a “bog witch,” rather than someone younger? Maya: I’ve always enjoyed playing with the ‘witch’ trope and its natural overlap with the scientist, almost as much as I liked the idea of my magical prophecy-born prince being the result of an experiment conducted by a social scientist from a different world. The combination of a young protagonist plus an older magical mentor is a staple of both fantasy and Sci Fi works, so I figured I could not only subvert the traditional gender of the pair but also reverse whose perspective it might be told from. LSQ: If you could magically believe something into existence, what would that be? Maya: Right this moment? Ice cream. Any other day it’d be World Peace, but you caught me at a weird time. LSQ: The ending of this story does not have finality. What do you see Dr. Taterra Myshtaq and Prince Bartholomew getting up to in the future? the king of Hu, but also by Charles Lioness, Taterra’s former lover and, technically, the owner of the former prison moon. Needless to say that adventure, romance, and general questing ensues. While the story is told from multiple perspectives, Taterra’s has always been a particularly fun one from which to write. Maya: Like most writers I have a few balls in the air at all times. I am currently seeking publication for a YA novel titled Clothilde, which takes place a long time from now in the Historical City State of Jerusalem. Beneath the city, in the Well of Souls, the last prophet of Earth leaves a message for Lyla Shavit, a draft-dodging, hard-drinking, saxophone-playing high-school dropout. There’s telepathy, space monks, depressing Middle Eastern geopolitics and all that jazz. My true love, however, is middle-grade, and I am currently working on a children’s book called Passover Knight in which a Jewish eighth-grader chooses to become a knight. There are dragons, princesses, and AP Bio pop-quizzes, as well as lessons to be learned about friendship, courage, and toxic masculinity. There’s also a talking horse named Stasheff who has a lot of opinions about Science Fiction tropes. Then of course there’s that pesky dissertation…..